Northwestern Kodiak Island, including the East Arm of Uganik Bay, Uganik Lake, Uganik River drainage up to Mt. Glotoff. See area map (Image file 94 kB). Uganik River flows through grass/salmonberry and cottonwoods flats along the lower elevations. It is surrounded by dense alder covered steep slopes. Alpine areas start at about 1500'. Inland area is composed of steep ridges with several small alpine lakes. The southeast end is extremely mountainous with steep ridges with glaciers and permanent snowfields. 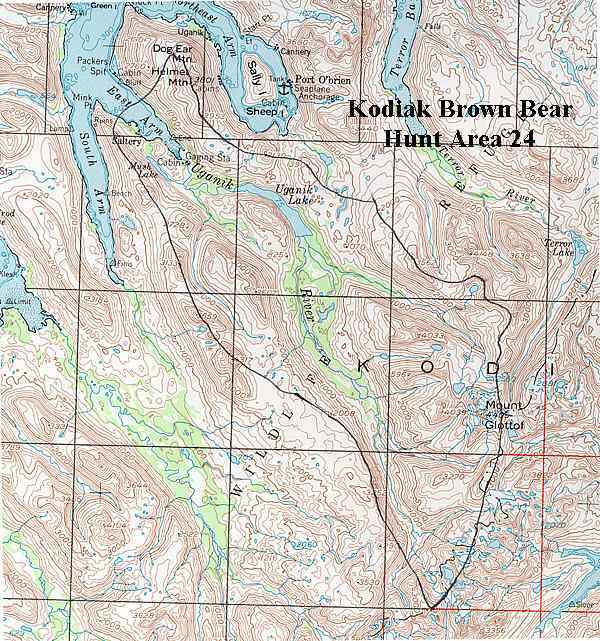 Most of the area is within Kodiak National Wildlife Refuge with some private inholdings. A U.S. Fish & Wildlife cabin located on Uganik Lake.